From Russia With Love Video Slot Review - Casino Answers! From Russia With Love is a 5-reel, 25-line video slot developed by Playtech, featuring a wild symbol, scatter wins, multipliers, a free spins feature, a gamble feature and a bonus game. You can play the From Russia With Love video slot at Bovada. Coin values on the From Russia With Love slot machine are $0.01, $0.05, $0.10, $0.25, $0.50, $1, $2 and $5. You can bet from 1-25 paylines at 1-10 coins per payline. You can bet anywhere from the minimum total bet of a penny per spin up to the maximum total bet of $1250 per spin. From Russia With Love has an incredible betting range so no matter what type of online slots player, the From Russia With Love slot game will be ideal for you! You can use the skill stop feature to manually stop the reels at any time during a spin. To play the From Russia With Love video slot, select your bet and hit the “Spin” button. You can also press “Bet Max” to play all 25 lines at 10 coins per line. The top paying symbol on the From Russia With Love online slot is the Wild Onion symbol. 5 of a Kind will pay out 10,000X your bet if on an active payline. The Wild Onion is From Russia With Love’s wild symbol and will substitute for all symbols except for the scatter and bonus symbols. The scatter symbol is the Vodka symbol. You will need 3 Scattered Vodka symbols to receive a scatter payout. 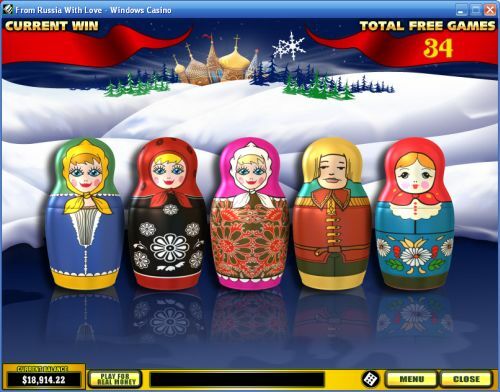 You can get a scatter win of up to 250X your total bet on the From Russia With Love slot machine. Whenever you get a winning combination on the From Russia With Love slot game, you can elect to use the gamble feature by pressing the “Gamble” button. You can choose to double your winnings or double half of your winnings. Once you choose your bet, the dealer’s card will be turned over. Your goal is to pick a higher card from the remaining four cards on the screen. To bank your winnings and exit the gamble feature on From Russia With Love, press the “Collect” button. Only the highest win is paid per selected payline. Winning combinations pay left to right only except for the Scattered Vodka (which pays any). Payline wins are multiplied by the bet per line. 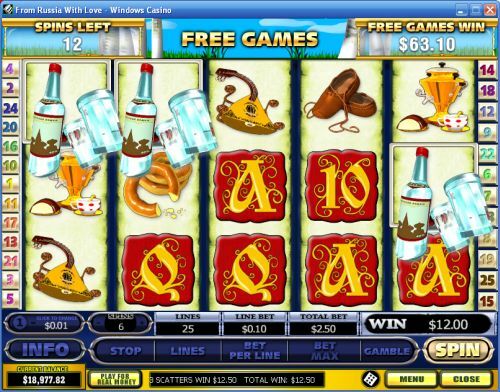 Scatter wins are multiplied by the total bet and added to payline wins. From Russia With Love has a basic autoplay mode. You can use the “+” and “-” buttons to select up to 99 autoplay spins. You can also type in the number of autoplay spins that you wish to play. Press the “Auto Start” button to begin the autoplay mode. You can stop the From Russia With Love autoplay mode by hitting the “Stop” button that is below the autoplay counter (not the skill stop button). Playtech has put together yet another solid (or better) video slot in From Russia With Love. It’s got everything – a bonus game, free spins, multipliers, an excellent top payout and also a gamble feature too! You can try the From Russia With Love video slot when you sign up and play today over at Bovada! Where’s James Bond on the From Russia With Love slot game? This is a Russian-themed video slot, not a James Bond themed video slot! However, you can play a 007-inspired iSlot called Spy Game. Where can players from the USA play the From Russia With Love video slot? Players from the United States are currently unable to play this video slot for real money. However, if you want a video slot with a European feel, we recommend that you read our Hurdy Gurdy Video Slot Review.